The U1b is an urban folding knife which can be described as being something special. 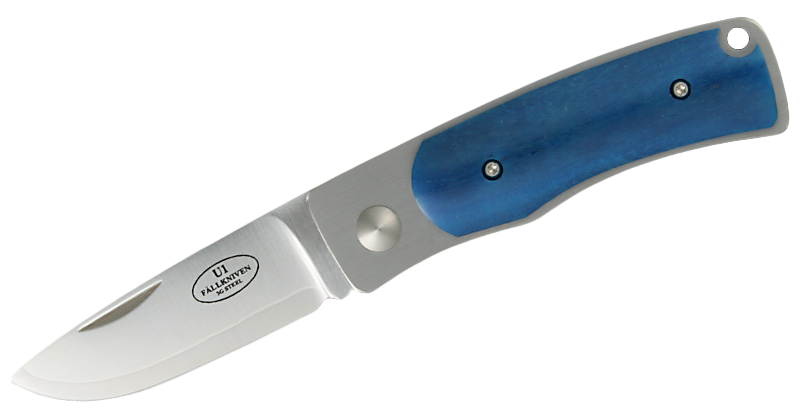 As with all Fallkniven models it combines modern steel technology with a blade making technique that goes back for hundreds of years. Since the U1b lacks a blade lock it is considered by many to be a pocket knife however the system which is employed here is quite ingenious in itself. The blade is actually held into its place by means of a springsteel key. This technique has been in use for over a century and actually makes sure that the blade does not fold. The blade is made out of the now legendary 3G style which is a laminated powder steel flanked by two layers of anti-corrosive steel to ensure maximum cutting capability. Apart from this feature, the 3G steel ensures that the blade retains an edge which is truly out of the ordinary. The blade length when closed is 3.25 inches whilst when it is open, this comes to 2.5 inches. The steel hardness is the nominal 62HRC which is definitely as hard as it gets in this trade. 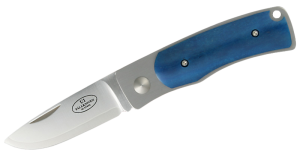 The Cocobolo Blue Bone handle is another beautiful and highly attractive aspect of this knife model. It comes in a deep shade of blue and feels very hard although at the same time it allows maximum manoeuvrability as well as positioning. The grip is also pretty impressive and quite useful when it comes to carrying out certain unpleasant tasks such as skinning and boning. What is definite is that the U1b is not just your average urban knife but it can be used in several different contexts and situations.